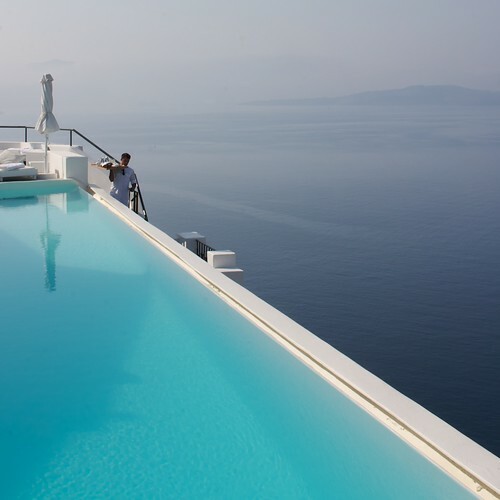 It's a long way to Santorini. No, really. According to Google Earth, it's 6,930 miles as the crow flies from San Francisco (SFO) to Thira (JTR). That's one seriously dedicated crow! Somewhat surprisingly, stopping off in London (LHR) and Athens (ATH) takes you a mere 69 miles out of your way, for a total of 6,999 miles (clearly the Greeks and the Romans knew how to position their cities for optimal air travel from the West Coast). But enough said; it took us a while to get there. On arrival, though, awesomeness. Sunday morning at 7.40am we arrived at the Katikies Hotel in Oia at the north tip of the island. We expected a roll of the eyes and a gruesome wait---after 15 hours of traveling---for a 4pm check-in or whatever. Not so! Sparkling wine, breakfast by the pool, a tour of the hotel, and imminent room-readiness were what in fact greeted us. We couldn't have been happier. It's quite the place. Santorini rises out of the sea atop 700-foot cliffs, and the towns cling to the edges of the island spilling down said cliffs like a viscous liquid. The Katikies is very much a "spilling down the cliff" hotel, with 95 steps from our room (a little way down the cliff) to the lobby (higher up the cliff) and another 15 steps up to the streets of Oia. Makes for a great infinity pool, though, and some nice photos. Day 1 we rather just hung around and took it all in. Honeymoon style.